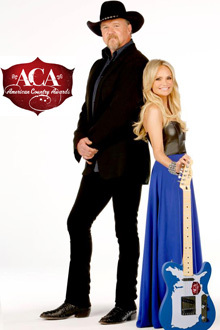 The American Country Awards will air live tonight (Dec. 10) from Mandalay Bay in Las Vegas on FOX at 8 p.m. ET. Trace Adkins and Kristin Chenoweth will host the two-hour special for a second year. The awards show will feature performances from both Adkins and Chenoweth, in addition to Keith Urban, Lady Antebellum, Dierks Bentley, Jason Aldean, Rascal Flatts, Luke Bryan, Kip Moore, Jake Owen, and Little Big Town. Additional appearances will include Country artists Eli Young Band, Florida Georgia Line, Gloriana, Love and Theft, Casey James, Miranda Lambert, LeAnn Rimes, Lee Brice, Jana Kramer, Dustin Lynch, Natasha Bedingfield, Scotty McCreery, Lauren Alaina, and Chris Young. Ron White and the San Francisco Giants’ Brandon Belt and Barry Zito will also be in attendance.